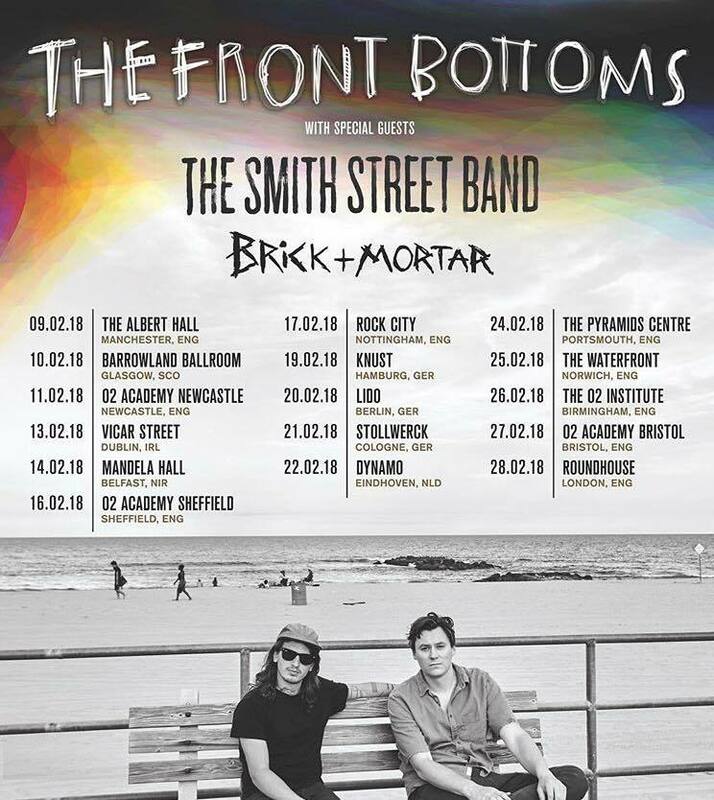 American Indie band the Front Bottoms are playing at Portsmouth Pyramids on Saturday February 24th, supported by fellow New Jersey natives, Brick &plus; Mortar, and Australians, The Smith Street Band. The show is part of their UK tour for 2017 album, Going Grey. The Front Bottoms formed in the mid 2000s, and self-released their first album, I Hate My Friends, in 2008. Their sound blends rock with a bit pop and punk and witty lyrics for an overall sound that's reminiscent of the Mountain Goats. Their latest album, Going Grey was released in late 2017 and features singles Raining, Vacation Town and Peace Sign. Brick &plus; Mortar are another New Jersey band. They toured with the Front Bottoms back in 2016, but have also been playing gigs and releasing albums since 2008. The duo released their latest single, One Little Pill, in 2017. The final band on the line-up are Australians the Smith Street Band. Their songs feature their unmistakeable Aussie drawl, with a laid back style that still knows how to rock. Tickets are £18.75 and can be purchased online from the Pyramids Live website. Under 14s must be accompanied by an adult, and under 21s must show ID for purchasing alcohol. The bands will be playing at the Pyramids Plaza at the Portsmouth Pyramids Centre on Clarence Esplanade in Portsmouth. Doors open at 7pm.